After a brief pause, in which I wanted to share some newly discovered beauty and wellness tips from Thailand, we’re back to the Peter Thomas Roth Mask Vault. After all, we still have 3 masks left to review! 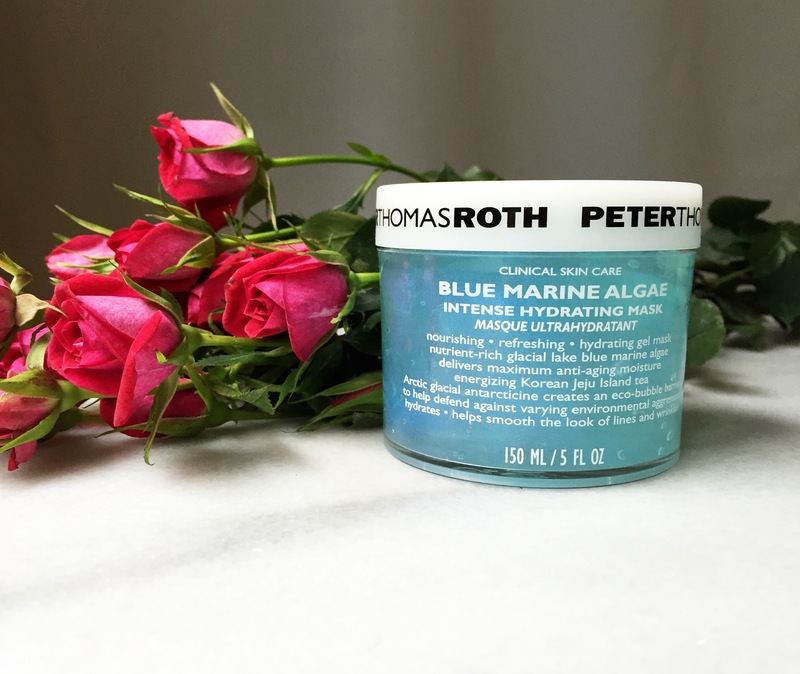 Similar to the Rose Stem Cell mask, the Blue Marine Algae mask called to me because of it’s bright, delicate color and beautiful gelée infused with bubbles in all the right places. It just screamed hydration. And if we’re being honest, the deep sea is equally interesting as outer space—I’d just as quickly put some deep sea extracts on my face as some magical Martian dust. So, count me in. That being said, I couldn’t really find a time to use it. Between Moor mud masks on the daily, the occasional rose stem cell or 24k gold treatment and of course the occasional bee venom treatment to the forehead.. how and where could I fit in an algae mask? Thankfully, in my double-masking, super extra Korean beauty queen downtime, I finally found time to start using the algae mask on its own and when I did, I didn’t regret it. First, let’s dive (no pun intended?) into the ingredients and some of the research behind this product’s ingredients. Water/Aqua/Eau, Salvia Officinalis (Sage) Flower/Leaf/Stem Water, Glycerin, Pseudoalteromonas Ferment Extract,Pseudoalteromonas Ferment Extract, Kappaphycus Alvarezii Extract, Algae Extract, Maris Aqua (Sea Water), Sodium Hyaluronate, Mica, Silica, Carbomer, Sodium Hydroxide, Disodium Edta, Citric Acid, Caprylyl Glycol, Potassium Sorbate, Sodium Benzoate, Phenoxyethanol, Titanium Dioxide (Ci 77891), Blue 1 (Ci 42090). I was surprised to see sage extract as the second ingredient—even before glycerin—but keep in mind that a mask is typically 60-75% water. With glycerin acting as the humectant, you would expect it to fall in the 4-6% range. That means sage extract is somewhere in-between the two, with an estimated concentration of 5-10% (my estimate), making it the #1 active ingredient in the mask. If you followed along with the Farm to Face collection this year, you know that I approve of salvia officinalis (sage) oil use in skincare, because of its high rosmarinic acid content and the anti-inflammatory, anti-oxidant and skin whitening benefits, but I am pretty much alone on those thoughts. Sage is without a doubt a controversial beauty ingredient, with many experts claiming that it is sensitizing, and therefore the benefits outweigh the risks. Then again, the research is fairly novel and still developing, so perhaps that’s why PTR and I are on the same team. Antarctine is dope, and nobody knows about it. As for whether or not the Antarctine in the Blue Marine Algae mask is enough to make a difference? There’s no way to know for sure, but my estimates put the Antarctine concentration in this mask at 2-5%; In other words: there’s a chance that the concentration of Antarctine used in the mask matches research levels. Moving onto the other ingredients in the list, Camellia Sinensis leaf extract—which could be any of a variety of Chinese tea leaves but is most likely white tea—has been found to have good anti-oxidant, anti-aging and skin smoothing properties. It’s best used in concentrations of 3-5%; here we would expect 3% at most. Upon further reviewing the claims, I realize that the Camellia Sinensis is in fact tea harvested from South Korea’s Jeju island. While that sounds awesome, it’s just.. tea extract. Jeju is beautiful but white tea is white tea. Next is “Kappaphycus Alvarezii” or red algae extract, a marine algae of Hawaii that has been studied extensively, followed by “algae extract” and then sea water. Compared to the terrestrial plant, “seaweed is rich in some health-promoting molecules and materials such as, dietary fiber, ω-3 fatty acids, essential amino acids, and vitamins A, B, C, and E” making it great for cosmeceutical use (source). Algae is anti-inflammatory, anti-oxidant and certain types can be used as a tyrosine inhibitor for skin lightening treatment (making it very popular in Asia). In expected 2-3% concentrations each, the algae in this mask might be in just a high enough concentration to protect and lighten skin over time. Finally, the sodium hyaluronate (eye drops, anyone? lol) in an expected concentration of 0.5-1.5% (which is actually perfect) gives the mask one more water-binding ingredient (in addition to glycerin, Antarctine, marine water) with enough research backing it up to be effective. Hyaluronic acid can hold 100x it’s weight in water, but sodium hyaluronate is thought to be more effective, because of its higher compatibility with skin (source). Next are several colors (why’d you think the mask was blue? ), glitters, preservatives and other ingredients that are neither harmful nor beneficial to the skin. But hey—it doesn’t have a scent. That’s a BIG plus for most skincare lovers that I know! Given the ingredient list and surrounding research, one would expect light results, but the mask should be calming and hydrating. It may or may not reduce wrinkles over time; I think that the Antarctine research is pretty conclusive—for what research there is. Many of the ingredients are water-binding, so I would expect it to be an intensely hydrating mask. This is just one of those products on the fringe of natural beauty, without any of the power-house anti-agers, and we simply don’t know how it will go. Then again it’s a mask, so immediate results are what we’re aiming for. -Blue Algae: Soothes, nourishes, and infuses skin with nutrients and humectants to help defend against dehydration and prevent future damage. -Tea: Sourced from the Jeju Islands of Korea, delivers deep nourishment and abundant moisture. -Antarcticine: Unique glycoprotein sourced from Arctic glacial ice helps skin retain water and protect against water loss in extreme climates or temperatures. -Microalgae and Sea Water: Provide bioprotective moisture and minerals to help maintain a hydrated state in the skin all day. Beyond the fancy nomenclature and marketing language, I think this does sum up what the mask should do. Again, it took me forever to get around to actually using this mask, and when I did? For some reason that I still haven’t figured out, the mask gave me a light tingling sensation on my upper lip, similar to the experience of using an AHA / BHA mask. I still am totally not sure what was going on there. However, after wearing the mask for 15 minutes and gently washing it off my forever-dry-from-fighting-adult-acne skin felt… moisturized. The strange thing is the moisture didn’t stop with that day. Despite the instructions calling for one to use the mask 2-3x a week, I continued to use the Blue Marine Algae mask every day for a week and my skin is STILL hydrated, a week later. Daily masking has made me realize that there’s really some method to the madness; in China, most of the men and women my age use sheet masks daily. While I find sheet masks to be very hit or miss, using a reputable mask daily seems to have its benefits. And while I know that a jar mask isn’t the most ideal (yes, light and air both affect antioxidants), this mask isn’t very heavy on the antioxidants.. so what’s the harm? This Peter Thomas Roth Mask Vault experiment has been very, VERY interesting. I started off super excited to try all the indulgent masks, then suddenly found myself losing faith in the mask set. So far, in the 4 out of 6 masks, the ones I DIDN’T think I would like at all.. are the ones I enjoy the most. The Blue Marine Algae mask’s “bang for the buck” isn’t in the Jeju tea or the “blue” marine algae.. it’s really in the Antarctine—a weird bacteria found in glacial mud—and the basics: sodium hyaluronate, sea water, and glycerin. The rosmarinic acid as the #1 active ingredient was wholly surprising to me, but given recent research developments surrounding rosmarinic acid, it shouldn’t be that surprising: it’s highly anti-inflammatory, making it a great calming ingredient for this mask. 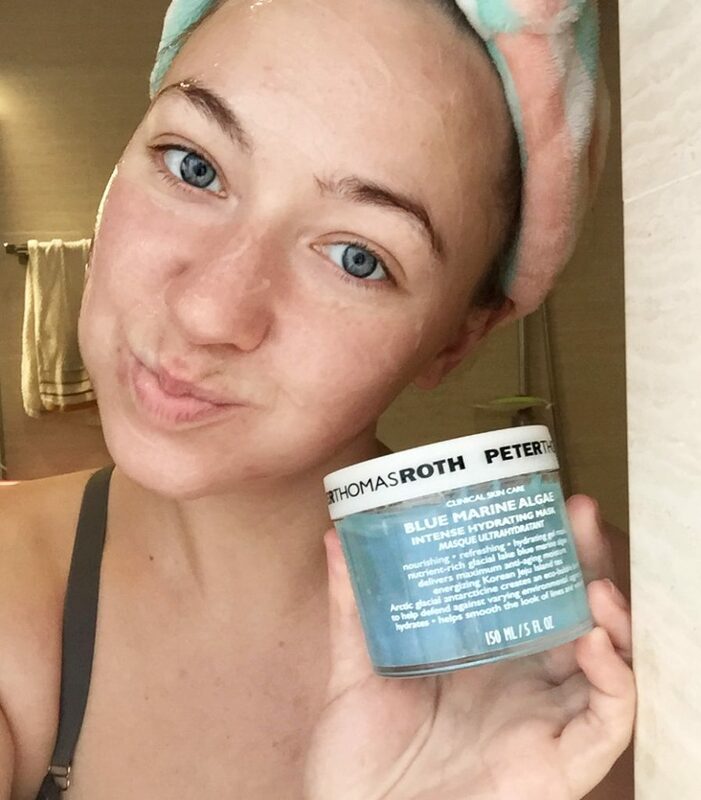 If you want your skin to feel watery and dewy—and potentially take down your crow’s feet in the process—I recommend giving the Blue Marine Algae Mask a shot! Gentle Reminders: Thanks for reading! If you liked what you read, scroll to the top right of the page, enter your email in the box and click subscribe! This post contains affiliate links. Clicking on and/or purchasing through these links helps support this content. I am looking at the reviews to see not only impressions from others, but the age group to whom they apply. Thus far, It seems that they work for the 18-29 group and I am 68 years-old.My mind may be young, but I don;t know if that segues over into my epidermis! Great blog though…as usual. Haha! You’re too funny–and definitely young at heart! Another reader had really great success with the bee venom mask for her fine lines. She has a kid my age, so I think she’s out of the 18-29 age group 😉 Those results are immediate and also build up over time. Otherwise, whether or not the products can be effective depends on what you’re aiming to accomplish. When you look at reviews on Sephora, you can sort the reviews by age group, skin type and more, but not for everything, including this product. I don’t know why. If you’re looking for moisture and the mask doesn’t do it for you, a really great way to bring moisture to SUPER dry skin is with Peter Thomas Roth’s Laser Resurfacer.. though the results are very temporary. A different feeling than this mask–resurfacer feels like a dry moisture/silicone slickness more than a wet dewiness–but it works. (Seen here: http://www.sephora.com/laser-free-resurfacer-P278021). You’re so interesting! I don’t believe I’ve read through a single thing like this before. So wonderful to find somebody with unique thoughts on this subject. Really.. thanks for starting this up. This website is something that is needed on the web, someone with some originality! This design is steller! You definitely know how to keep a reader entertained. I really enjoyed what you had to say, and more than that, how you presented it.